Dallas Albert Willard (1935-2013) used to amusingly say, in his classic philosophical prose, “I discovered America on September 4, 1935.” Born in the small town of Buffalo, Missouri, he stepped into the next stage of his “eternal destiny in God’s great universe” seventy-seven years later, on May 8, 2013 in Southern California. As a four-year-old boy he discovered an early love of books when he followed his siblings to their rustic one-room schoolhouse set in the humble majesty of the Ozark Mountains. Books would always be magic windows that looked into new worlds filled with adventure and challenging ideas that set his mind alight. He never outgrew his passion of learning and told of reading Plato as a teenager after a long day working as a migrant farm worker. Even after graduating college and his ordination as a Southern Baptist minister, Dallas knew there was still much more to learn. He considered himself "abysmally ignorant" about God and the soul, and a “hazard” to those who listened to him preach. So he decided to attend graduate school and study the “big ideas” of philosophy, knowing that Jesus and his teachings were addressing the same questions philosophers have been wrestling with throughout human history. It was at this time that God gave Dallas a prophetic message: “If you stay in the churches, the university will be closed to you; but if you stay in the university, the churches will be open to you." Dallas allowed God to direct his steps into academia and was offered an Associate Professorship at the University of Southern California in 1965 without even applying for the job. Dallas loved teaching and considered it a noble profession responsible for the condition of the world in years and centuries to come. His teaching, writing and research at a technical, academic level continues to nurture young minds towards truth, reason and God. 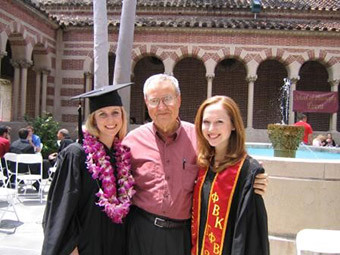 His battle with pancreatic cancer brought about his retirement from teaching at USC at the end of 2012, but he continued teaching even deeper lessons until the day of his passing. 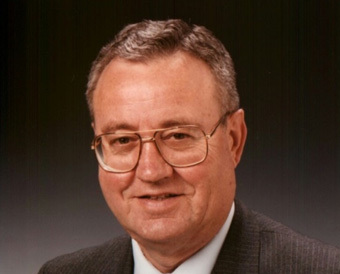 Dallas’s knowledge of philosophy and theology, along with his background in psychology and science (his first B.A. 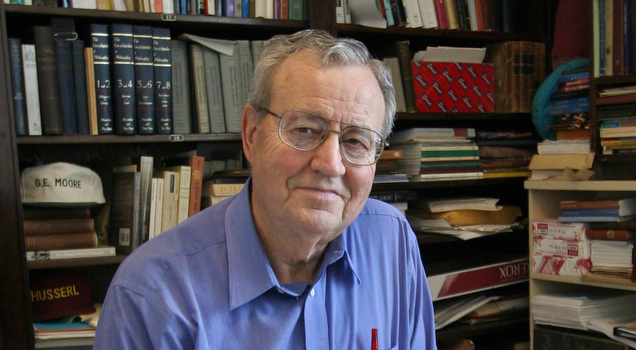 was in Psychology and his Ph.D. work included a Minor in the History of Science), were a potent combination that prompted invitations to teach around the world in diverse areas, Christian and “secular,” with a unique perspective and gentle authority. Dallas explained that the intersection between his philosophical and Christian teachings could be found in the simple question: Who are you going to become? He often told people who were pursuing truth about life that, "If you could find a better way to live, Jesus would be the first one to tell you to take it.” He believed that this realization made it possible “to do honest inquiry in any area [of thought] and meet people of different persuasions on the field of common inquiry and not based on assumptions that must be protected at all costs." Dallas emphasized the importance of intentionally choosing to live your daily life in ways you believe Jesus would live it if he were you. He considered spiritual exercises like prayer, service, study, worship, solitude, and fasting an important means of that intentional decision to grow in Christlikeness through God’s grace. 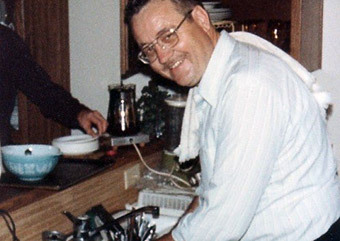 What made his teaching so contagious was his gentle manner and thoughtful invitation to take small steps with God that quietly and certainly lead to transforming us into the likeness of Jesus Christ. 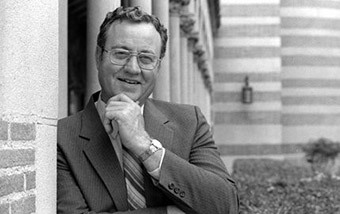 The life of Dallas Willard had a radically life-changing effect on those who came in contact with him, and many of his former students are now university professors committed to furthering the ideas they learned from him. 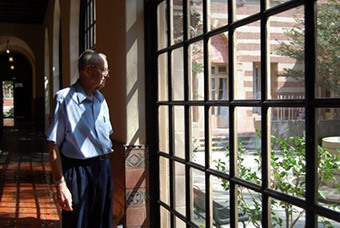 Many tributes have been spoken, blogged and written since his passing in gratitude for his life, including Gary W. Moon’s beautiful collection of reflections, Eternal Living, published in 2014. Each of these tributes is a special gift to the Willard family and we gladly share them in thankfulness for all God has done through Dallas. Sometimes we get caught up in trying to glorify God by praising what He can do and we lose sight of the practical point of what He actually does do. Dallas Albert Willard “discovered America” on September 4, 1935 in Buffalo, Missouri. 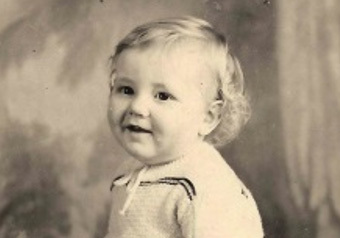 His mother liked to leave his hair long because she loved his curly hair. 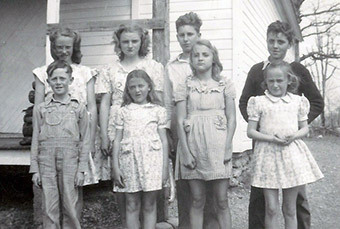 This is Dallas’s 8th grade class picture, taken outside of their one-room school house. 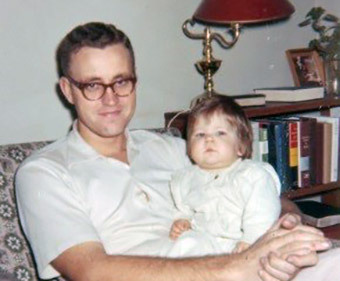 Dallas became a father when John Samuel Willard was born on February 16, 1957. The family lived in this small trailer in Waco, TX, while Dallas finished his B.A. at Baylor University. 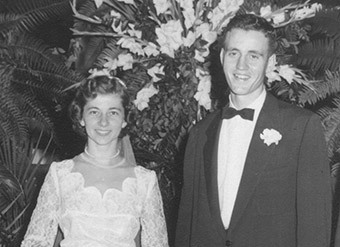 Rebecca Willard (Becky) arrived on February 17, 1962 in Madison, Wisconsin while Dallas was working on his PhD at the University of Wisconsin. 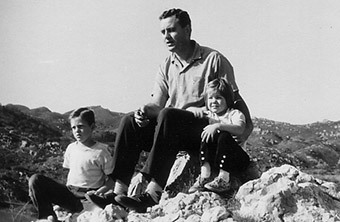 Dallas, Jane, John and Becky made Southern California their home in 1965, when Dallas joined the faculty at the University of Southern California. These hills surround the family home in the San Fernando Valley. During the 1970’s in the San Fernando Valley, the Willards met Pastor Richard Foster (founder of Renovaré and well-known spiritual formation author) and Pastor Bill Vaswig (founder of Preaching and Prayer Ministries and author of I Prayed He Answered). 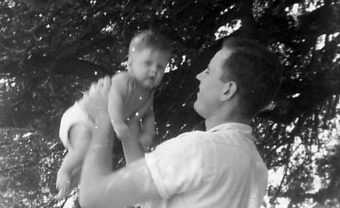 The three men (pictured here in 2002?) encouraged and partnered with each other in ministry throughout their lifetimes. 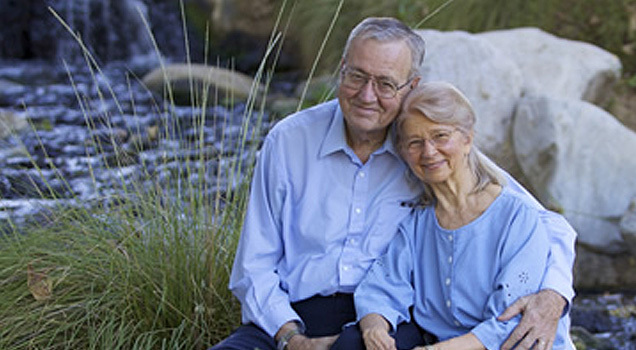 Dallas & Jane participated in USC’s Faculty-in-Residence program during the 1981 & 1982 school years. They resided in an apartment building near campus that housed USC Honors Students and engaged in activities ranging from cultural outings to discussion groups to Dallas’s “Willard Waffles” on Saturday mornings. Dallas has been serving waffles in this picture. Dallas began teaching week-long courses in Masters and MDiv programs at other schools around the country (and Canada) in the 1990s. 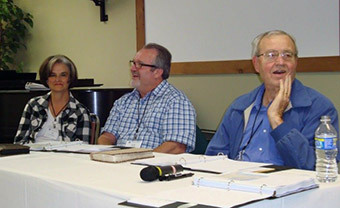 He became and annual part of the Fuller DMin program and worked closely with Gary W. Moon to develop the Renovare institute for Spiritual Formation. He is pictured here with Jan Johnson and Keith Matthews who taught with him for Fuller and Renovare. 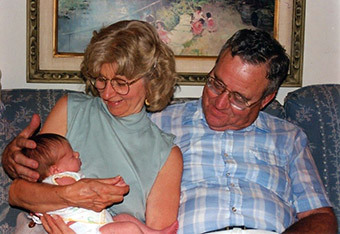 Dallas & Jane became grandparents on July 17, 1998. Their granddaughter was born while Dallas was on a plane headed for the C.S. Lewis Oxbridge conference in the U.K. He said that getting on that plane was one of the hardest things he’d ever done. Dallas returned from the trip with a Paddington Bear for 2-week-old Larissa. Commencement is always one of the highlights of the school year. 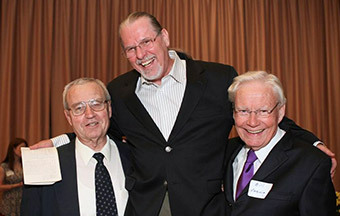 Dallas is pictured here with two members of the graduating class of 2005. Although we didn’t know it at the time, this picture was taken on Dallas’s last day at USC. Mudd Hall of Philosophy, August 2012. 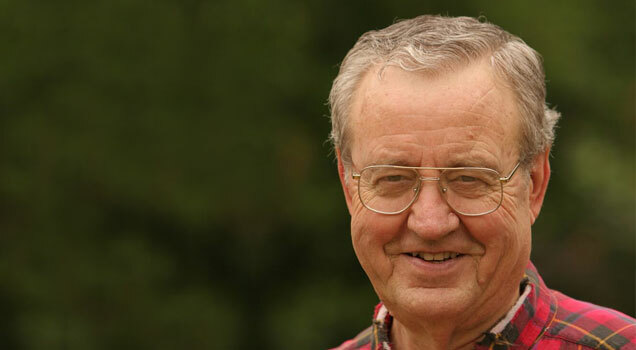 Dallas Willard passed away on May 8th, 2013 after a short battle with cancer.